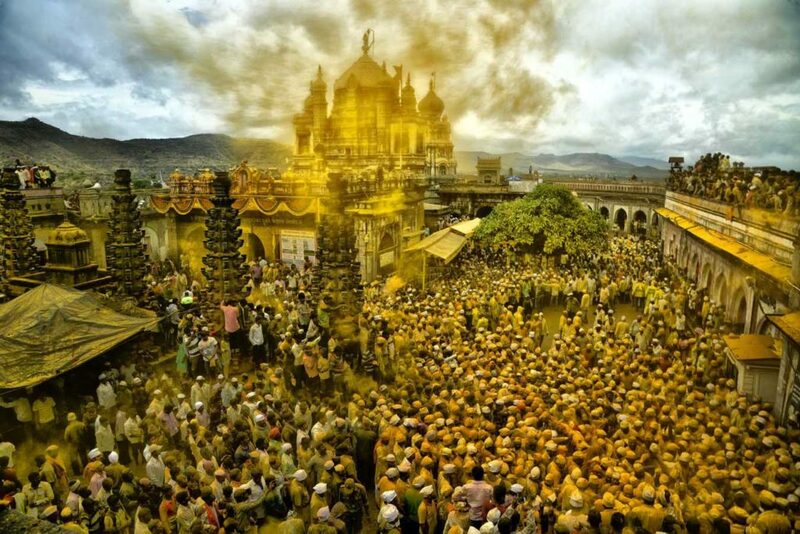 “Sonyachi Jejuri”- as the holy town Jejuri is called aptly by the native Maharashtrians, which means “The Golden Jejuri”, comes alive when one looks from the roof top of the Khandoba temple at the porch, at the stairs, at the roads, at the entire Jejuri city and at the people around it when they gather here in myriads during the sacred day of Somawati Amavashya(new moon day that falls on Monday) to pay their reverence to their family god Khandoba. 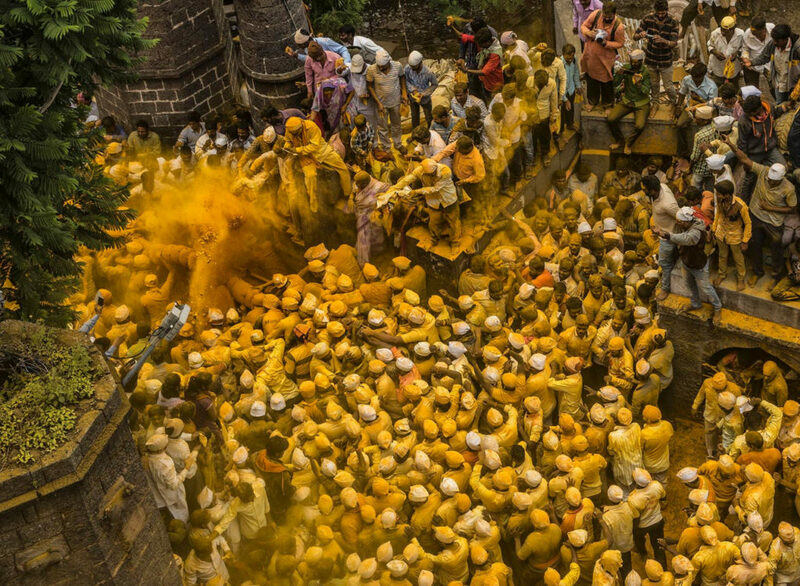 A veil of golden yellow turmeric powder engulfs the entire town in combination with the holy chants “yelkot yelkot jai malhar” “sadanandache yelkot” offered by his dedicated followers. The complete area starts reverberate with faith and devotion. 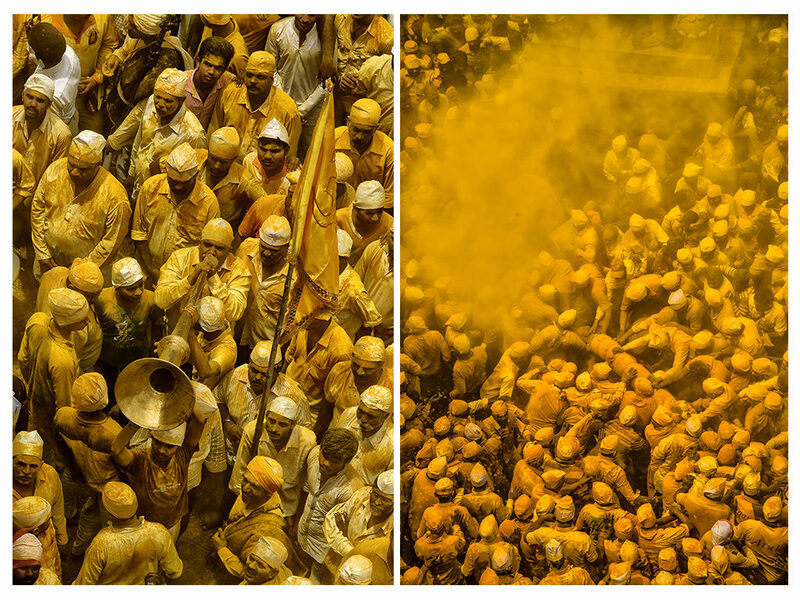 The entire atmosphere gets soaked into the mood of a devine celebration with the purity of golden turmeric. Lord Khandoba , regarded as the “god of Jejuri” is probably be the most versatile and widely acknowledged god being worshipped across many regions, religions, casts and communities. He is the most popular Kul Devata (family god) among one of the oldest shepherd tribe “Dhangar” and the patron deity of Deshastha Brahmin too. People from other communities like warriors, farming and herding castes too keep their high regards towards him. The cult of Khandoba has prominent linkages with Vaishnava and Jain traditions despite him being worshipped as Martanda Bhairava, a form of Lord Shiva. In the temple of Jejuri, surprisingly both the deities of him and his wife Malsha is in the form of Lingas (one of Lord Shiva’s most known statue form) which are covered with decorated silver masks. 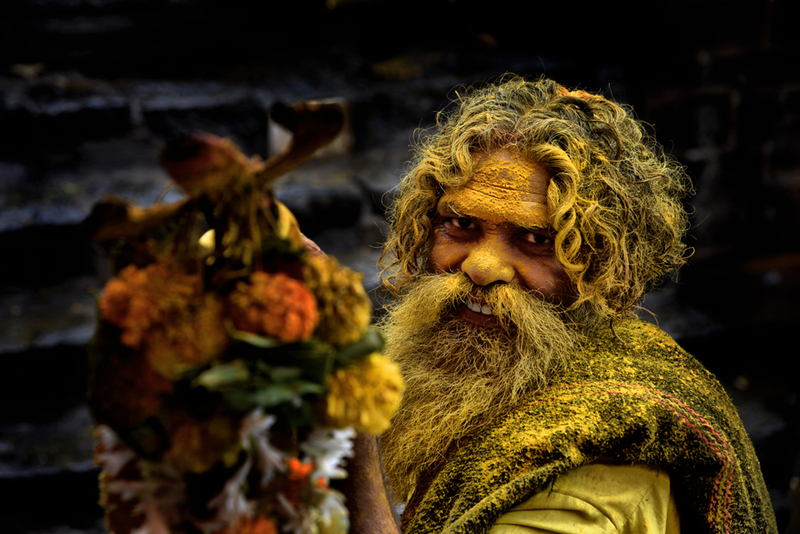 A part of the Muslims too consider him as their god Mallu Khan and been seen offering goat flesh in the temple areas. This way people consider him as one of the rare non-vegetarian Indian god. Surya and Kartikeya Skanda are his other depictions too. Summing up these all makes the place a universal pilgrimage and an utmost colourful offbeat rural festival. 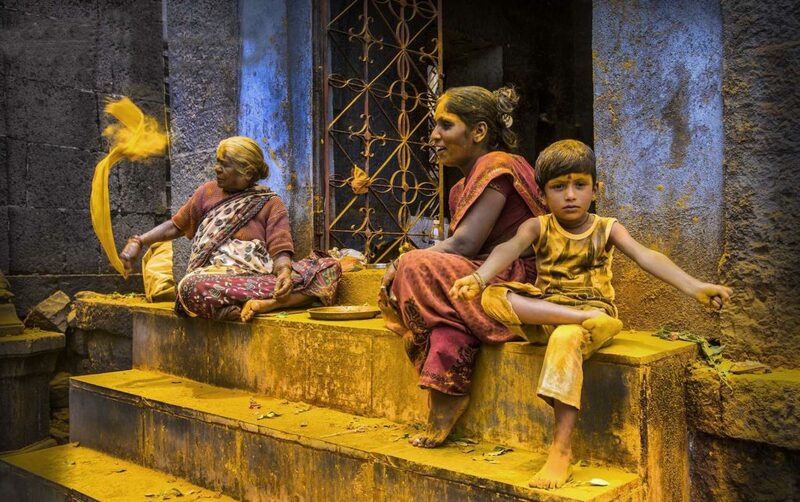 But the offering of turmeric powder to paint the city golden yellow has its many reasons, logics and traditions. 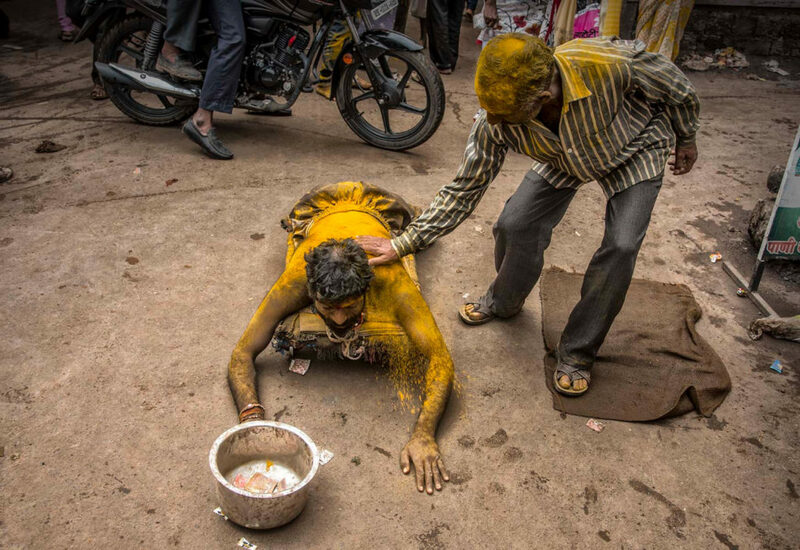 Many believe the tradition came from the yore old great Indian tradition of applying turmeric to the bride and groom as an antiseptic agent to protect their immunities as the festival is to celebrate the wedding ritual of Lord Khandoba and his wife Malsha. Some believe it to be the offering respect for his being from the Surya- the symbol of power and brightness. Many paintings depict him riding a horse with a bowl full of turmeric powder in the hand may serve the reason of the amber golden celebration. It is believed that Khandoba is the god of Sakamabhakti, which means the god who fulfills all the desires of his devotees. In turn, devotees offer him penance or sacrifice in the form of various self inflicted religious rituals like mortification of flesh, bare foot pilgrimage, piercing the body, whipping oneself in public as a part of their Ugra Bhakti(violent devotion). 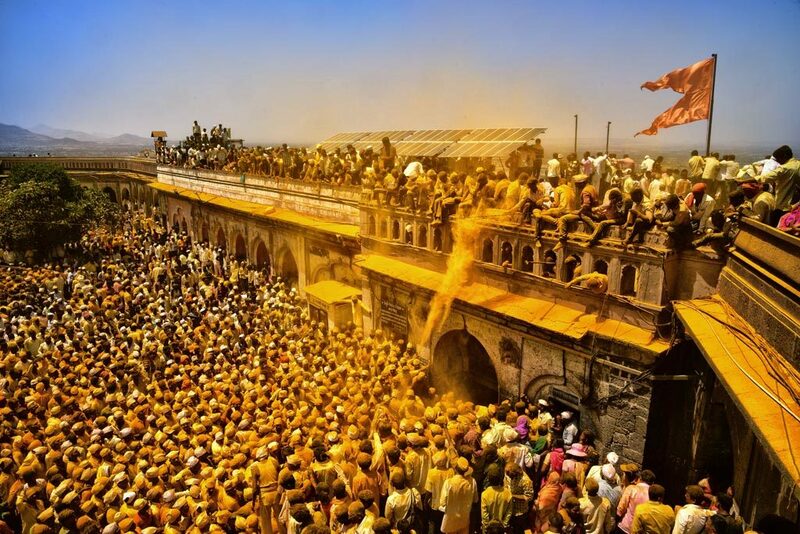 On the very auspicious day, a Palkhi(palanquin) is taken out from the main temple situated at the hilltop carrying the idols of Lord Khandoba and his wife Malsha for a holy bath in the river Karha. The procession climbs down the 200 steep stairs those connect the temple to the ground level along with the protective stone walls. 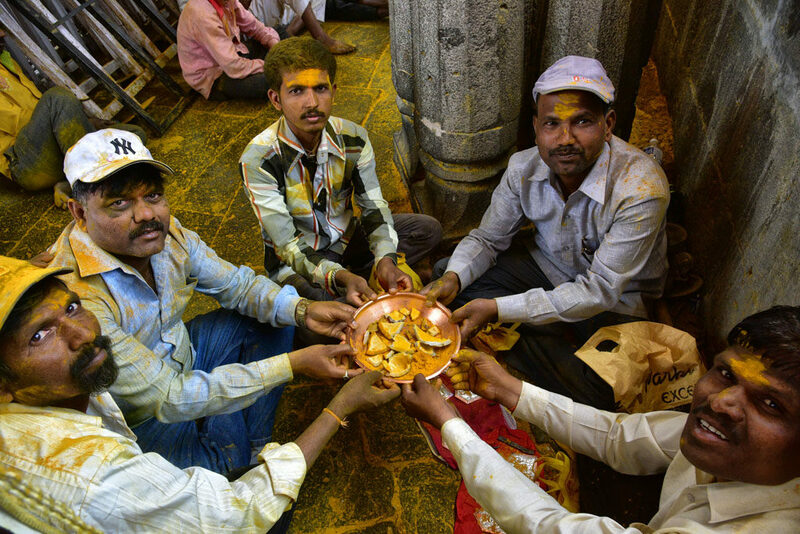 It continues amidst the devotees’ religious chant mixed with their Bhandara(turmeric powder mixed with dry coconut) offering. 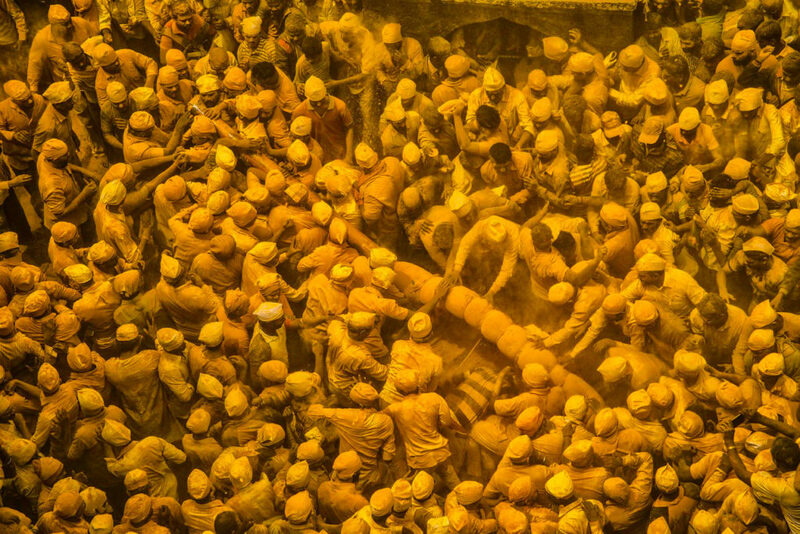 A golden yellow cloud prevails everywhere the procession goes through. 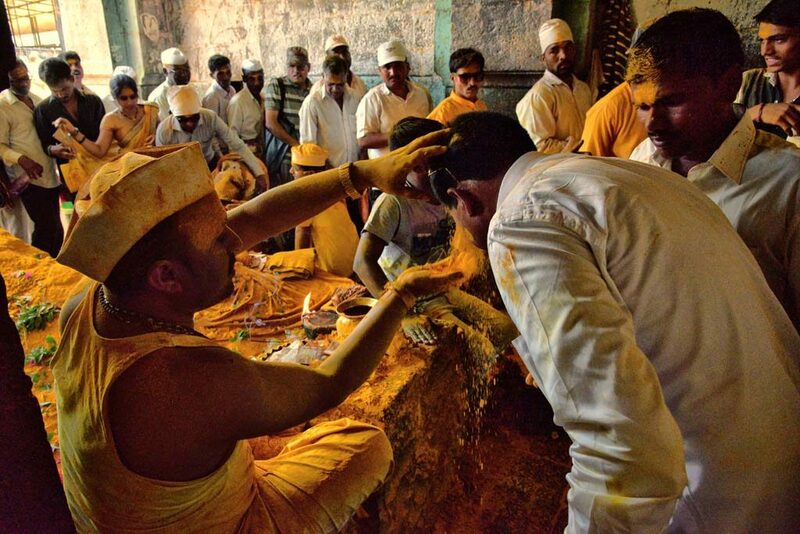 With the holy dip, the ritual of the Khandoba marriage is recreated. At the end of the day, the idols are taken back to the shrine. A series of thousands of lamps get lightened on the spectacularly constructed Deepmalas(stone structure to place burning oil lamp on ) to welcome the gods to their abode and brings up a divine atmosphere around the temple. 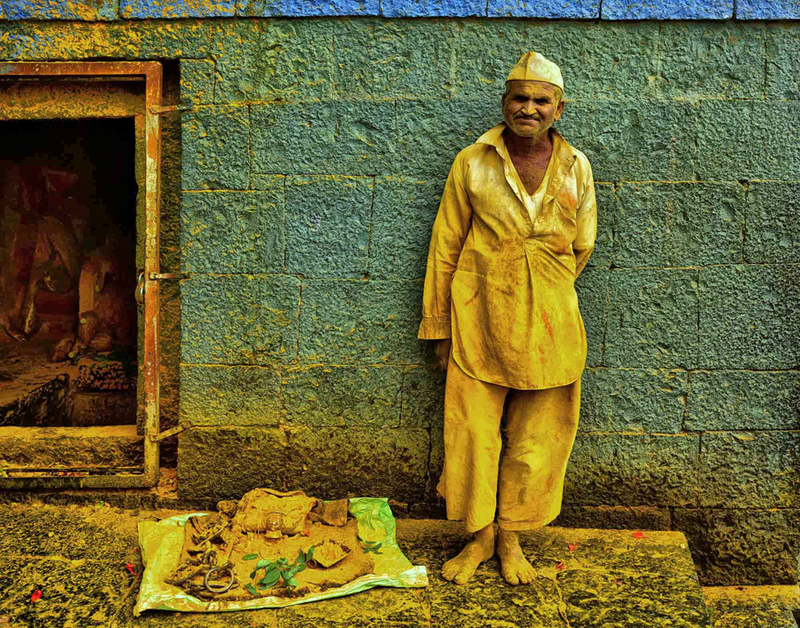 Thus, Jejuri influences the heart of millions with its Midas touch. 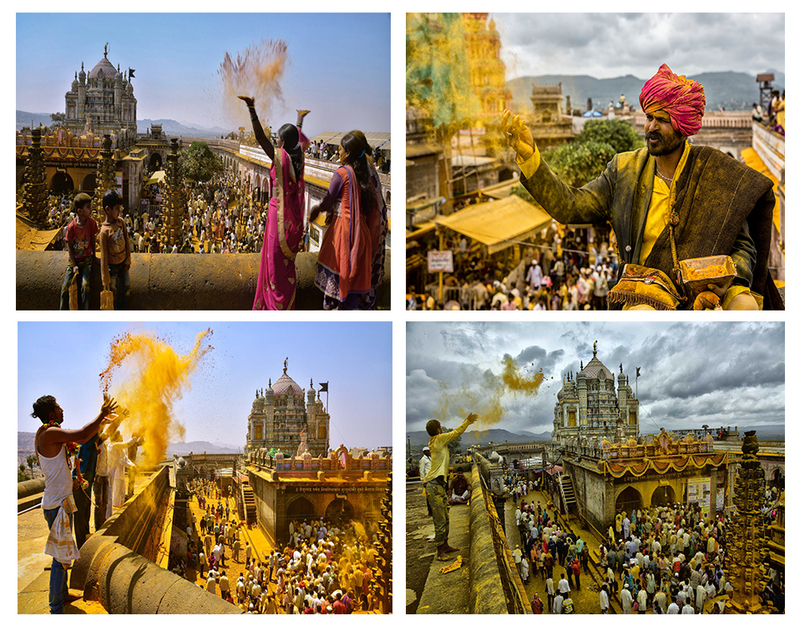 Excellent colorful vibrant images depicting the true essence of the celebration.Very well covered and the photographs does convey the sentiments,enjoyment,religious and last but not the least enthusiasm of the people. 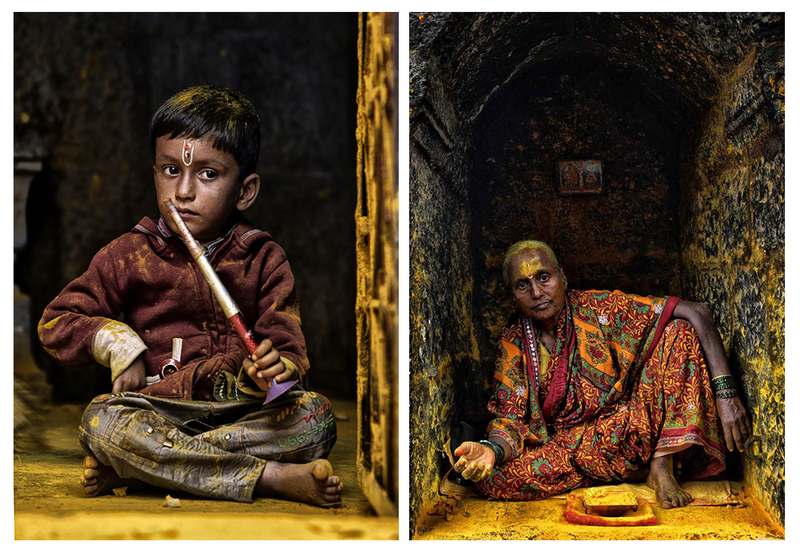 Lovely Photographs.. And Great Initiative…..
Amazing collection and good story behind each snap. I could literally feel being present in the place. Congratulations to all photographers. Wonderful photography and interesting story.